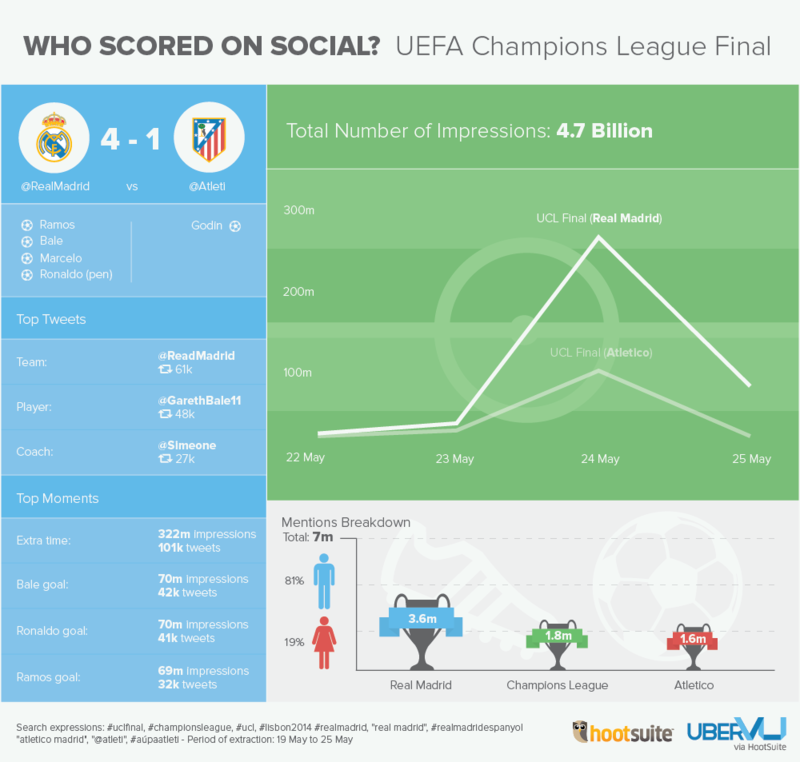 UEFA Champions League: Who Scored On Social? The UEFA Champions League final was a frenzy of social media activity, not only from fans, players and teams, but from brands looking to get in on the buzz with real-time social marketing. The explosion in topical and timely content, often referred to as ‘culture-jacking’ has seen brands try to captilise on conversational trends to drive brand reach and awareness. Last year the Champions League final attracted an audience of 150 million and aired in over 200 countries—a truly global event. This year we watched Atlético Madrid and Real Madrid try to make history by becoming the first team to defeat their city rival in a European Cup final. Between the fairy-tale Atlético story, and big name football stars, social media was buzzing with activity. We’ve taken a look at the global conversation across multiple social networks including Twitter, Facebook, Google+, blogs and forums using data from uberVu via HootSuite. We measured conversation volumes, impressions and sentiment based on keywords related to the #UCLFinal and all associated teams, players, coaches and brands—and we found some clear social media winners. The #UCLFinal was certainly a huge topic of conversation between May 23rd and 25th, earning a total of 7 million mentions and driving 4.7 billion impressions. Real Madrid came out the social winners taking 51% of conversation. The most used keywords in these conversations were “Real Madrid”, “Madrid”, “Atletico”, “Lisboa”, “Win”, “Ronaldo”, “2014” and “Manana”. The sentiment towards the final was overwhelmingly favourable: 26% positive and 68% neutral, with just 5% of these considered negative suggesting fans were more inclined to cheer their team rather than taunt the opponent. The demographic swing was also predominantly male with just 19% of overall conversation female. There were a number of huge moments during the final which will see this game go down in history as one of the most exciting, these are those moments in the eyes of social media. Sergio Ramos scores in the 93rd minute to take the game to extra time driving 101,000 tweets and 322 million impressions including the keywords “extra time”. Gareth Bale’s extra time goal to put Real Madrid into the lead was the second most tweeted moment accumulating 42,000 tweets, driving a total of 70 million impressions. Finally, Cristiano Ronaldo was hot on Bale’s social tail with 41,000 tweets about his penalty and 17th Champions League goal in the final minute of extra time – breaking all previous league records. Shortly after, he released a video on his official YouTube Channel showing all 17 goals which currently stands at 330,000 views. With the explosion in second-screening, people often rush to Twitter to retweet important announcements. This final was no different, with tweets from Real Madrid and their players accumulating the most visibility from retweets. With real-time marketing at the forefront of many social media strategies, the UCL Final was another opportunity for brands to captilise on this pop-culture trend. Oreo remains the brand synonymous with real-time marketing, tweeting within minutes of the power failure at Super Bowl XLVII, a tweet often still used as an example of this trend. Sponsor brands utilising conversational trends included Heineken, HTC, Mastercard and Ford. However Adidas came out the social winners, garnering 1,000 retweets of their winners’ annoucement, part of their ‘#allin or nothing’ campaign. With just a few weeks until the World Cup, this is just the start of football ruling global conversation. With more brands looking to get in on the real-time marketing action, who will be this years’ World Cup social winners? Watch this space for the launch of our World Cup series very soon. To find out more about UberVU via HootSuite analytics, register here for our latest on-demand webinar. Dan is HootSuite's EMEA Community Lead. He tells tales of community endeavours, features, news items and how communities across the globe use social media and HootSuite to transform messages into meaningful relationships.